To avoid any financial pain that may be derived from the Recovery Audit Contractor program, hospitals need to become familiar with the process that will be in effect in every state by 2010. As most hospital administrators can attest, Medicare will go to great lengths to detect and recover any overpayments made to facilities, physicians, and suppliers. The latest effort is the Recovery Audit Contractor (RAC) program, whose mission is to reduce Medicare’s improper payments through the detection and collection of overpayments, the identification of underpayments, and the implementation of actions that will prevent future improper payments, as ordered by section 306 of the Medicare Modernization Act. The Centers for Medicare & Medicaid Services (CMS) began a three-year demonstration project in March 2005 that focused on California, Florida, and New York—states with the highest Medicare expenditures. The Tax Relief and Health Care Act of 2006 mandates that the CMS implement RAC programs nationally no later than January 1, 2010. Programs will be implemented on a rolling basis beginning this year. RACs, which are private companies with proprietary search engines of Medicare and Medicaid rules, subject all claims to their proprietary automated review software algorithms to identify overpayments and underpayments. Data mining is followed by a request for repayment or a medical records request for auditing. 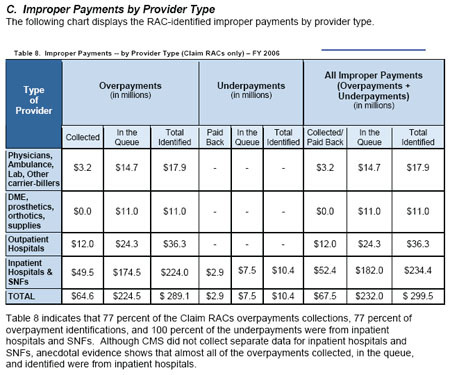 Under the program, RACs are paid a percentage of the payment errors that they identify. The demonstration project has been a success, according to Nancy Hirschl, president of Hirschl & Associates, a coding compliance and revenue integrity consulting firm. “The RAC program will become an ongoing part of everyday work at hospitals. It is time consuming and resource intensive, but most hospitals have not added staff to handle the extra work. It takes hospitals a considerable amount of time to review RAC findings, identify whether or not they agree with RAC findings, and compose and submit their rebuttals,” she says. According to the CMS RAC Status Report, the pilot project collected $68.6 million in overpayments and $232 million on the queue (in the collection or repayment process but not yet returned by or to the provider), and received $2.9 million in underpayments for a total of $303.5 million in improper payments. These totals include both claim RACs and Medicare Secondary Payer RACs; Table 1 reflects claim RACs only. The RAC review program consists of three tiers: Part A — Diagnosis-related group (DRG) reviews where medical records are requested and reviewed; Part A and Part B — extrapolated payment errors where a medical record review is not required and transpose clauses are based on claims data; and Part B — durable medical equipment, drugs, and renal dialysis where medical records are requested and reviewed. Using DRG data-mining software programs, RACs analyze historical MedPAR data and identify accounts that possess the greatest potential for DRG overpayment error. However, random account selection is not part of the program. Training, education, and auditing are the cornerstones of the RAC demonstration and will continue to provide the foundation as it is rolled out nationwide. RACs are initially focusing on DRG payment errors, reviewing claims data as far back as 2001. In the demonstration, some of the top DRG requests seen in California were 416 concerning septicemia age greater than 17; 217 concerning wound debridements and skin grafts, except hand, for musculoskeletal and connective tissues; 468 about extensive operating room procedures unrelated to principal diagnosis; 124 about circulatory disorders except acute myocardial infarction, with cardiac catheterization and complex diagnosis; and 475 about respiratory system diagnoses with ventilator support. “Their best success has resulted from incorrectly coded services, noncovered [local coverage determination (LCD)] services, violations of Medicare Secondary Payor rules, and duplicate services,” says Julie E. Chicoine, JD, RN, CPC, the integrity program director at the Ohio State University Medical Center and an AAPC Legal Advisory Board member. The RAC Status Report noted that the most DRG changes were made in the following areas: 416 septicemia, age greater than 17; 397 coagulation disorders; and 217 wound debridements and skin grafts, except hand with debridement. According to Gloryanne Bryant, RHIA, CCS, senior director of corporate coding and HIM compliance with Catholic Healthcare West, there is the potential for miscoding several inpatient DRGs, including single complications and comorbidities DRGs, sepsis, and one-day stays and inpatient rehabilitation. One-day stays are being scrutinized to be sure that the patient met criteria for one-day stay acute care, a physician order for admit to acute care was obtained, and the admission was warranted for an acute level of care. Meanwhile, inpatient rehab records are being reviewed to ensure that the level of care was appropriate for the patient’s condition and the patient met criteria for an inpatient rehab setting. Outpatient services are being treated differently, notes Hirschl, in that medical records are not being reviewed manually but rather are being automatically processed for billing/charge errors. CPT coding and billing of blood transfusions, speech therapy, and high-cost drugs are being checked for billing and charge description master errors. According to Chicoine, RACs perform two types of reviews: the automated review and the complex (medical records) review. “No medical records are involved in the automated review,” she says. “RAC conducts data mining and identifies claims that contain an overpayment, ie, payment does not comport with LCD, [national coverage determinators], statute, regulation, etc. This typically involves a drill down on certain DRGs. The provider receives a letter demanding repayment. 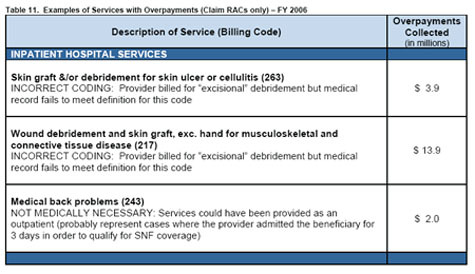 The provider bears the burden of proving that the RAC is in error and has 30 days to dispute the overpayment determination.” A typical example includes repayments for outpatient evaluation and management (E&M) charges that are not reasonable and necessary as they are in violation of global surgery bills and E&M services on outpatient hospital claims. Inpatients are DRGs identified through data mining. In the case of complex review, RAC will identify overpayments through data mining and then send the provider a letter requesting medical records for an identified number of overpaid claims to validate overpayment. Hospitals need to accept the fact that RAC is a reality and prepare themselves for the long term, says Hirschl. “Identify which department will hold the responsibility for tracking and trending outcomes,” she says. Chicoine advises hospitals to strategically consider proactively retaining their own RAC to conduct data mining on their behalf to identify overpayments and recover underpayments, which may offset RAC overpayment recovery. Bryant says hospitals should form a RAC task force, meet regularly to discuss strategies, and establish a RAC toolkit on their internal Web site that would serve as a centralized resource. This online toolkit should contain patterns and trends, an update of RAC findings, and include links to RAC articles and strategies. According to Bryant, once the hospital agrees with the overpayment decision, the RAC will process and deduct the money from future CMS payments. If the hospital disagrees with the RAC’s findings on a particular case, it has to submit evidence to support its stance. A determination will then be made within 120 days, and the hospital can ask for a redetermination by a qualified RAC, which will take place within 180 days. If the hospital still disagrees with the decision, it can request a hearing with an administrative law judge, which has to take place within 60 days. After that, the hospital can request a review by the Medicare Administrative Contractor, which will take place within 60 days. The final level of appeal is a judicial review by a U.S. District Court, which must be heard within 60 days of the contractor decision. Providers must respond within 45 days of receipt of a letter and include a photocopy of the entire medical record in question. The RAC has 60 days to review the provided information, verify that an overpayment exists, notify the provider of the overpayment, and demand that repayment be made. Providers may request an extension of time but must do so within the 45-day time frame. This can be problematic in that letters don’t always go to the right individuals or offices within a large institution, according to Chicoine. For example, they may be sent to quality review or midlevel financial departments, which can result in a delay in response. Additionally, RAC activity is not a one-time event for any provider. The volume of letters to any given provider can range anywhere from one or two to 100 per week. The volume of letters requiring medical records can be burdensome and range from 10 per week to 100 in one month. Hospitals should feel comfortable defending their data when they have documentation and information to support their decision and should feel empowered to do so, says Hirschl. Providers should note the favorable changes that the CMS is incorporating into the RAC program based on the lessons learned in the demonstration.